We feel we must go to Arizona or California in the spring or to the tundra in July to see masses of wildflowers...fiddlesticks! The most stunning display of wildflowers I have seen in years is just north and east of Denver along Highway 76 as we speak. 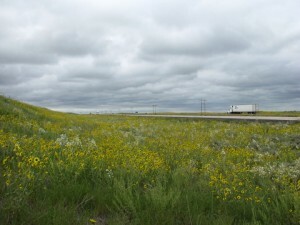 We were driving to Nebraska last Friday and the hills starting about 40 miles north and east of Denver along Highway 76 all the way to the Nebraska line were awash with a dozen kinds of yellow daisies (Sunflowers, Verbesina, Solidago etc. 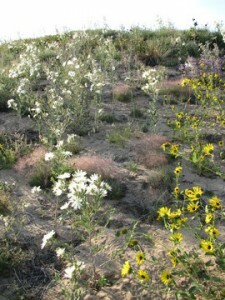 ), and the inverted white chandeliers of Evening Stars (Mentzelia nuda) and dense colonies of Purple prairie Aster (Machaeranthera bigelowii). We stopped again and again to admire the spectacle and take some pictures, which can't begin to capture the magic of the view. Our friends, John and Susan Spaulding, said that all the Nebraska sandhills were similarly dazzling, and the roads through them empty. Some of America's greatest floral spectacles are unheralded, unknown except to a few lucky locals! And yes, the grasses! They were a match to the showier flowers in my book: check out the purple mist of fairie-ring muhly (Muhlenbergia torreyi) in the first picture, which waved in the wind like a purple cloud...Ah! America we love you!